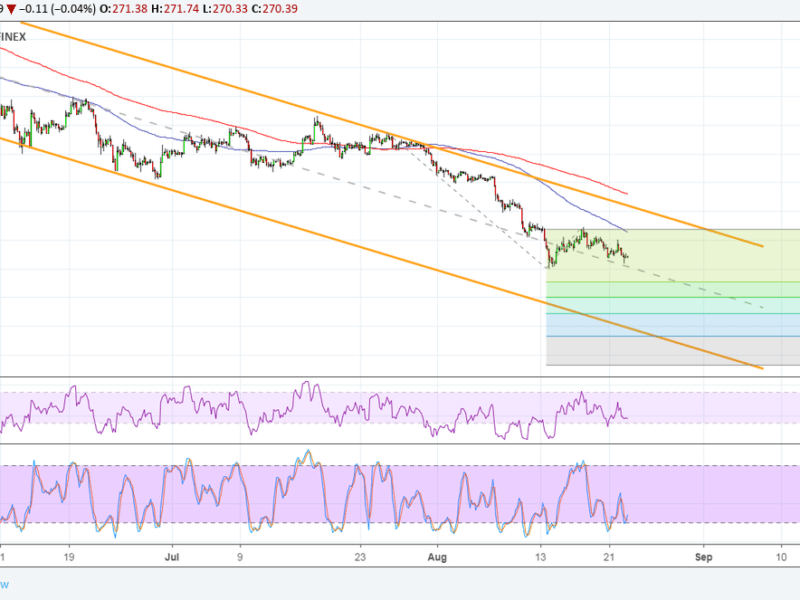 Ethereum is hovering around its mid-channel area of interest on the descending channel on the 4-hour time frame. Price looks prime for a continuation of the slide as it attempts to break below this support zone. If that happens, Ethereum could aim for the 38.2% extension next around $230, then the 50% extension closer to the $200 psychological level. Stronger bearish momentum could pull it down to the 61.8% extension at $172.26 or the 78.6% extension at $132.59. 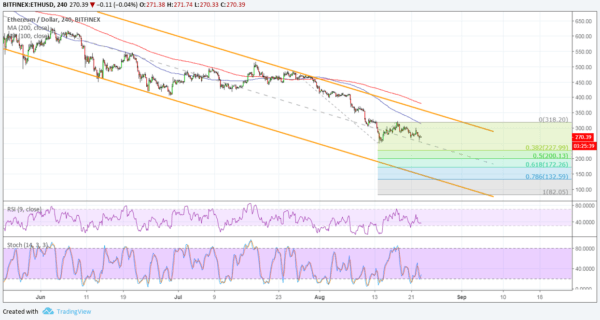 The full extension is at the bottom of the channel around $82. The 100 SMA is below the longer-term 200 SMA to indicate that the path of least resistance is to the downside. In other words, the downtrend is more likely to resume than to reverse. The 100 SMA could also hold as near-term resistance in the event of a move higher while the 200 SMA lines up with the top of the channel to add to its strength as a ceiling. RSI is on the move down to confirm that sellers are in control, and the oscillator has plenty of room to slide before hitting oversold levels. Stochastic is pointing down but is closer to the oversold region to reflect potential exhaustion among bears. Cryptocurrencies dipped on news that the SEC rejected a few Bitcoin ETF applications this week, leading many to believe that the next set won’t likely see approval. Recall that the regulator shelved its decision on a handful of applications until the end of September in order to make room for a longer comment period. The rejection is being seen as a setback by many in terms of the industry getting a nod of approval from regulators. It could also mean a longer time before crypto-based securities make their way to the mainstream market and lead to stronger liquidity and activity in the industry. With that, traders could hold out for the next SEC ruling in September.